‘Tis the Season to Eat Crawfish! Christmas holidays are over and the new year has begun. With the Mardi Gras season in full swing, it will soon be crawfish time in South Louisiana. Families and friends will be gathering for food and fellowship with weekend crawfish boils. These wonderful mudbugs may not be pretty, but they sure are tasty and the leftovers can make for beautiful dishes. Below is a recipe for Crawfish Etouffee from River Road Recipes I. The recipe in RRR I, tells you to boil the crawfish and gives the directions on how to do so. In today’s world, we are fortunate enough to be able to buy packaged crawfish tails. However, this recipe is a wonderful idea for leftovers from a crawfish boil, as well. Make it for your family, or perhaps a party you have planned. 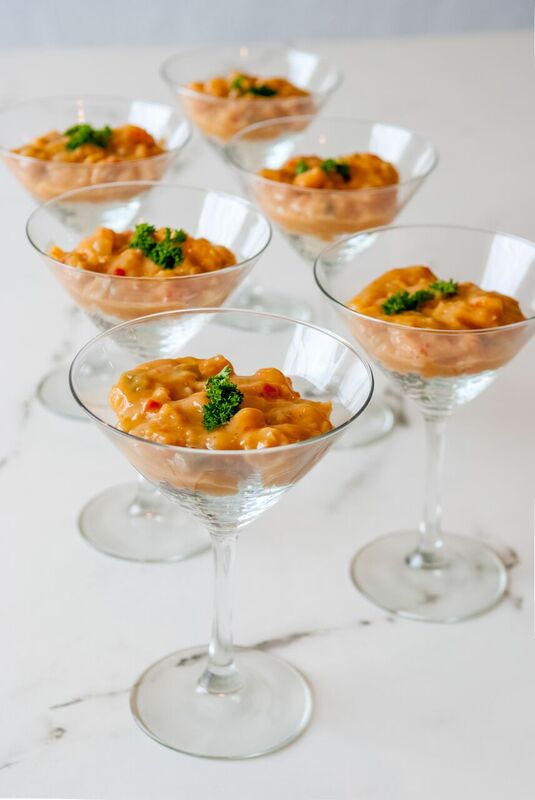 Serving the dish in martini glasses (as shown) or other decorative ware can make for a beautiful presentation and it can be served in appetizer portions. Having portions in easy to handle serving dishes makes it easier for your guests if you are having a buffet or cocktail party. This recipe makes about 8 quarts or 30 servings. It freezes well in ziplock bags or airtight containers. You may also cut the recipe in half. Crawfish Etouffee, RRR I p. 102. Photo by Don Kadair. The recipe has been adapted from the original, assuming you have the crawfish tails and do not need to boil. Salt, pepper, and hot sauce to taste. 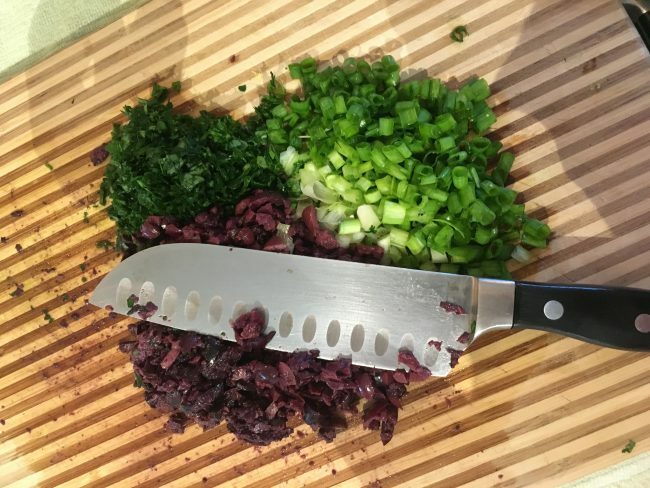 Grind (dice in a food processor) the vegetables and cook in shortening until tender. Add the seasonings and blend well. Add the crawfish tails (with the crawfish fat). Cook for about 15 or 20 minutes, but do not overcook. Turn the heat off and let it stand for 30 minutes until the seasonings are blended. Serve over rice. As school bells ring signaling the start of a new year, families everywhere will be faced with the weeknight dinner struggle. Taco Soup is an easy, hearty, crowd pleaser that can be prepared quickly, mostly with ingredients from your pantry. While the instructions state an hour-long simmering period, this recipe can be prepared in advance or left to simmer on the stove while homework is conquered. Double the recipe and freeze the leftovers of this delicious dish for the first fall chill. Tailor the toppings listed or add your own favorites to please everyone in your family. Best of all, the preparation of this dish only dirties ONE POT making cleanup a breeze! Brown the ground beef with the onion in a large saucepan, stirring until the ground beef is crumbly; drain. Stir in the undrained tomatoes, corn, undrained beans, seasoning mix, dressing mix, chili powder, garlic powder and Tabasco sauce. Bring to a boil; reduce the heat. Cook over low heat for 1 hour, stirring occasionally. Ladle the soup into bowls. Serve with the sour cream, cheese, green onions, jalapeno chiles, olives and avocado. After a long day I am sometimes at a loss for what side dish to prepare to accompany my main dish. Last week I turned to my mother, a former Junior League member, for assistance. Of course she knew exactly what I needed based solely on her knowledge of the River Road Recipe books and what I told her I had in my kitchen. Below is the easy and crowd pleasing Baked Cauliflower that saved the day! From River Road Recipes I, page 53. 1. Cook the whole cauliflower in boiling salt water for about 20 minutes. Drain and place in baking dish. 2. Melt Butter in small skillet. Add flour and stir until blended. Gradually add milk, stirring until smooth and thick. Add salt, pepper, pimento, and green onions. Blend. 3. Pour over cauliflower. Sprinkle with bread crumbs and grated cheese. Bake at 375 for 20 minutes or until slightly browned. Warmer weather is finally here, and it’s a great time to begin cooking outdoors again! 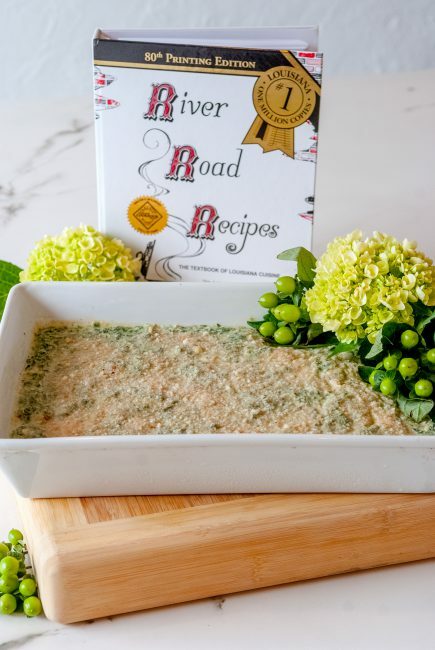 While the typical grill fare includes barbecue, hamburgers, or steak, if you’re looking for something different, River Road Recipes IV: Warm Welcomes has a fantastic Chicken Shwarma recipe that can be done on the grill. The preparation is a little time consuming, but the recipe makes a ton. You’ll be able to feed your entire family dinner, with plenty of leftovers to spare for lunches later in the week! Before you get started, be sure you have a wooden dowel and kitchen twine available. The Chicken Shwarma pairs perfectly with our Yogurt Dill Sauce and is great added to a salad or served as a main course with roasted potatoes (check out our Potatoes Forno recipe in RRR IV, p. 70), rice, hummus (RRR IV, p. 67), or a side Greek salad. Finish off your meal with a delicious piece of Baklava (RRR IV, p. 71) for dessert! Note: Meringue powder is available in most supermarkets or party supply stores and is used in this recipe to hold the chicken together while cooking. Mix the paprika, garlic powder, meringue powder, salt, onion powder, and pepper in a shallow dish. 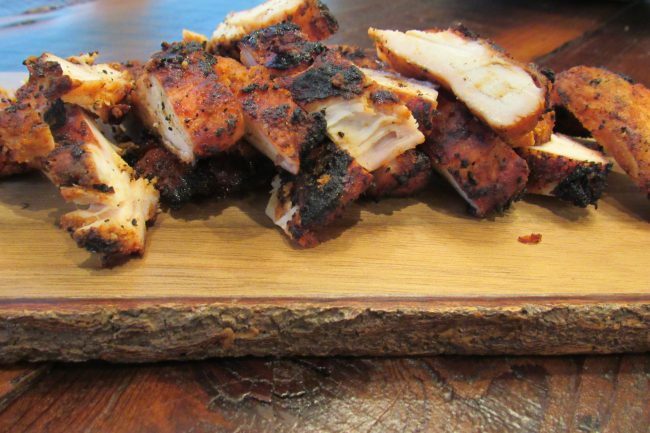 Pound the chicken 1/4 inch thick between sheets of waxed paper with a meat mallet. Coat the chicken with the paprika mixture. Cover a sheet pan with a clean tea towel. Arrange 1/2 of the chicken in a single layer on the tea towel. Layer the remaining chicken overlapping. Cover the layers with a clean tea towel and top with a sheet pan; press together. Chill for 1 hour. Remove the top sheet pan and tea towel. Using a wooden dowel or the end of a long wooden spoon, roll the sheet chicken onto the dowel and secure with kitchen twine. Grill the roll over hot coals for 45 minutes or until the chicken is cooked through, turning occasionally. Slice as desired and serve with the Yogurt Dill Sauce! This chilled Grecian sauce is used as a dipping sauce for the Chicken Swarma but is also delicious with other dishes in the Mediterranean Mixed Grill menu found on page 66 of River Road Recipes IV: Warm Welcomes. The sauce adds a cool and refreshing taste when combined with the warm flavors of a Mediterranean meal. Combine the yogurt, lemon juice, and dill week in a bowl and mix well. Store, covered, in the refrigerator until serving time. It goes without saying that Spinach Madeleine is hands down one of the most famous recipes in the River Road Recipes cookbook series. In fact, Spinach Madeleine was named as one of the Century’s Best Recipes in an article that appeared in the Houston Chronicle in December 1999. 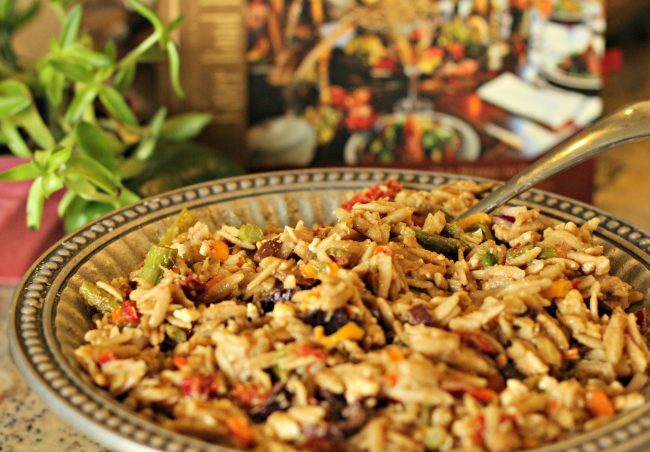 For many Baton Rougeans, no holiday dinner would be complete without this delicious dish! In honor of the upcoming Thanksgiving holiday, we wanted to highlight the history of this iconic recipe. 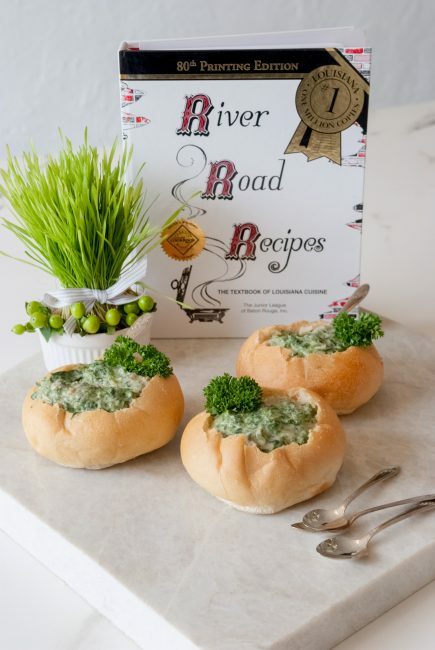 The original Spinach Madeleine recipe is found on page 63 of River Road Recipes I: A Textbook of Louisiana Cuisine. The recipe’s creator, Madeline Nevell Reymond, created this legendary recipe by accident. She was a young and inexperienced cook when she decided to use up a jalapeno cheese roll that she had in her refrigerator by adding it to a spinach dish she was preparing for a ladies’ luncheon. The result was a dish that became one the most popular special-occasion vegetable dishes in Louisiana. This is evidenced every year by the empty freezers in the grocery stores at Christmas time after all the frozen spinach packages have been snatched up. When Kraft Foods decided to discontinue making the jalapeno cheese roll, which is called for in the recipe, hundreds of distraught cooks called Kraft Foods to protest. The powers-at be at Kraft were amused by Louisiana’s devotion to their jalapeno cheese roll, but discontinued the product anyway. Fortunately, the River Road Recipes committee developed a new version of Spinach Madeleine in 2000 so that cooks can still serve this outstanding dish. A lighter version of the recipe appears in River Road Recipes III: A Healthy Collection. The recipe is versatile and can be served alone or as a warm appetizer dip with toast points or crackers. Spinach Madeleine also freezes well, so it can be made in advance of hectic holiday dinners! To make sure you have this holiday classic at your Thanksgiving table this year, check out the recipe here! We don’t know about you but we are Pro-Thanksgiving girls. It seems like stores are going straight from Halloween to Christmas and skipping this wonderful holiday. Luckily, this recipe makes it real easy to enjoy one of your favorite Thanksgiving comfort foods year round. The sweet apples combined with that rich bourbon is sure to please a crowd. 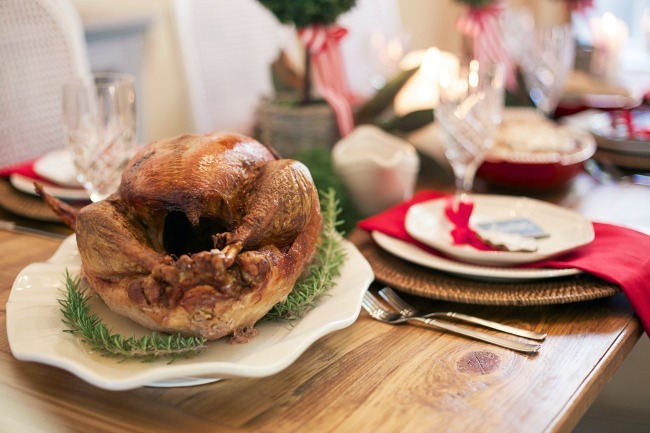 Apologies in advance if your husband passes out on the couch and blames it on the tryptophan. Also, make sure you find someone else to remove the neck and giblet bag. Seems like a good job for your mother in law. Place the oven rack in the bottom 2/3 of the oven. Remove the neck and giblet bag from the turkey, discarding the liver. Rinse the turkey with cool water and pat dry. Combine the onion, celery, apples and poultry seasoning in a bowl and mix well. Stuff the turkey with the apple mixture. Rub the salt and pepper over the outer surface of the turkey. Arrange the turkey, neck and giblets in a roasting pan. Roast at 350 degrees for 2 hours in a convection oven or 4 hours in a conventional oven or until a meat thermometer registers 180 degrees. Remove the turkey to a platter, reserving the pan drippings. Add the water to the reserved warm drippings and stir to loosen any crusty browned bits. Pour into a saucepan and bring to a simmer. Mix the flour and bourbon in a bowl and whisk into the pan drippings mixture. Cook over medium-high heat for 10 minutes or until thickened and of a gravy consistency, stirring frequently. Serve with the Turkey. Dr. Elizabeth “Betsy” Buchert operates her practice, Mint Health, in Baton Rouge, Louisiana, as both a conventional OB-GYN and a functional wellness practice. (Functional medicine is based on evidence that factors such as nutrition, sleep, exercise, stress levels, relationships and genetics are major contributors to disease.) She and her husband also have four young boys. In Betsy’s (limited!) spare time, she volunteers on the River Road Recipes Committee of the Junior League of Baton Rouge. 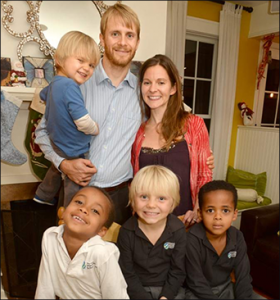 Betsy with her husband and four boys. Hippocrates, the Father of Medicine, told us this during his times, which was from 460-370 B.C. This comes from Thomas Edison, who lived from 1847 – 1931. Well we know these two men are super smart, for sure, but unfortunately this is not how most of us approach our health at all, and it is definitely not how we approach our medical care! I have to say, I LOVE food just as much as every other good Southerner. I love eating most of all, but I also love cooking (preferably easy) nutritious, health promoting foods for myself, my family, and my friends. I love the endless “I can’t believe how good this is” remarks I get when people eat at my house. The secret is not that I am an amazing cook, but rather that I know the importance and amazingness of whole, fresh, local food, AND I know the importance of avoiding processed, packaged foods – well, at least most of the time! There is a reason all the new trendy restaurants are Farm-To-Table! One of the talents I’ve become adept at in the kitchen (since I’ve learned Functional Medicine and definitely practice what I preach) is how to make substitutions, so we can keep eating the yummy foods we love, but in ways that are health promoting rather than health deteriorating. So we can “youthen” rather than “age” – ugh! Who wants to age ungracefully? 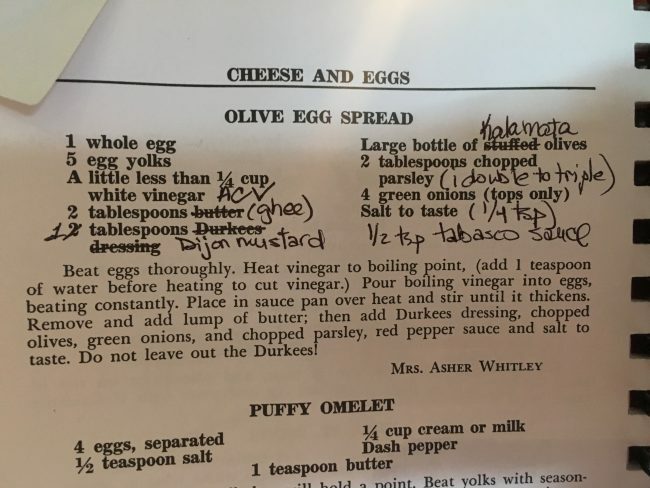 One area that can be tricky is having creamy dressings and party dips or spreads, so I was excited to find these two recipes in my copy of River Road Recipes I. 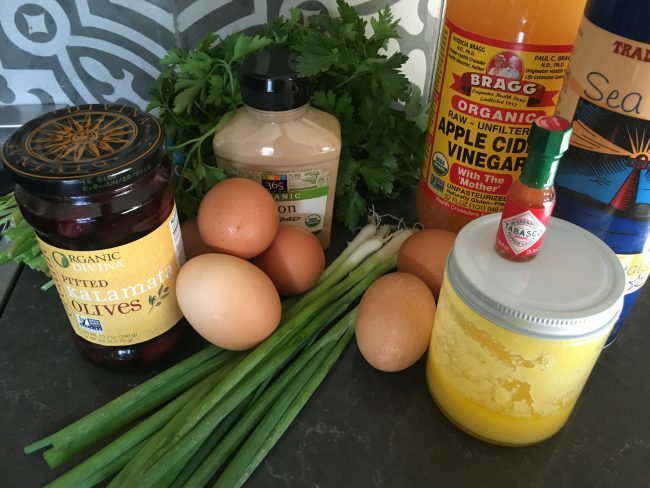 The “Egg Salad Dressing” on page 23 of RRRI is fast, easy, creamy, delicious, and so good for you (versus the bottles of things you may buy in the store with unpronounceable, suspicious ingredients). I made sure to use fresh, local, free range eggs, extra virgin olive oil (instead of “salad oil”), and the juice and grated rind from one fresh organic lemon rather than the prepackaged stuff (and it is Meyer Lemon season right now – an extra plus!). We ate this dressing mixed with a bunch of fresh assorted greens, like swiss chard and baby kale (it’s greens season, too! 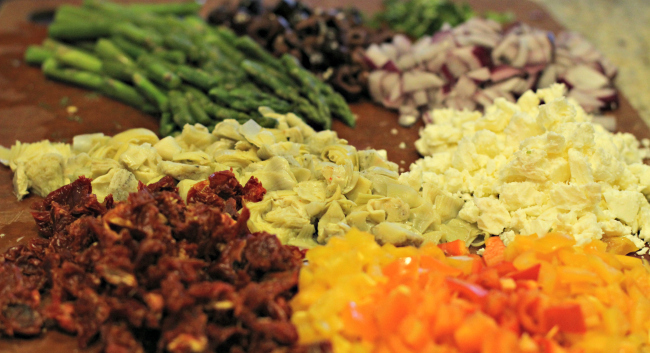 ), the chopped whites of the eggs, some olives, and fresh brightly colored bell peppers. 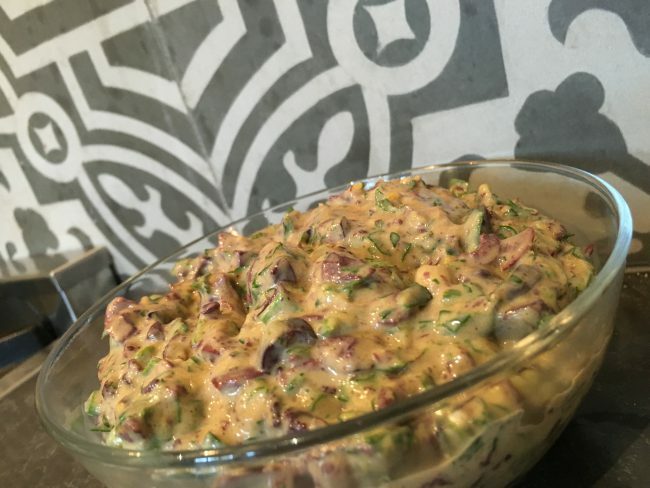 The “Olive Egg Spread” on page 70 of RRR1 is also another good find, although I prefer to call it simply “Creamy Olive Dip.” It’s a little spicy, very flavorful, creamy, and can be made filled with good-for-you ingredients. We all ate it for dinner one night spread on a crunchy nutty toast (https://www.mynewroots.org/site/2013/02/the-life-changing-loaf-of-bread/), and my husband couldn’t help himself from polishing off the rest of the bowl with a spoon. 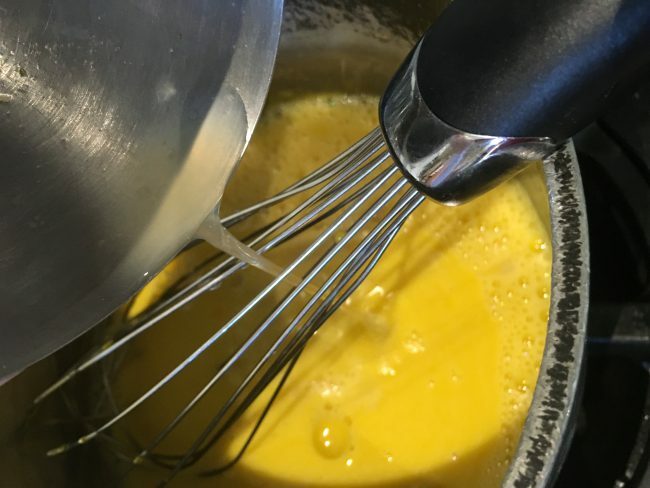 In this recipe, again I made sure to use fresh, local, free range eggs (the nutrient content is completely different from standard store bought eggs). I also used raw organic apple cider vinegar instead of white vinegar, ghee instead of butter, Dijon mustard instead of Durkees, and Kalamata black olives. And the parsley and green onions come from local farmers (I order from indieplate.com at least once a week to keep a flowing supply of produce, eggs, and meats from our local farmers). What a great spread of health promoting foods! 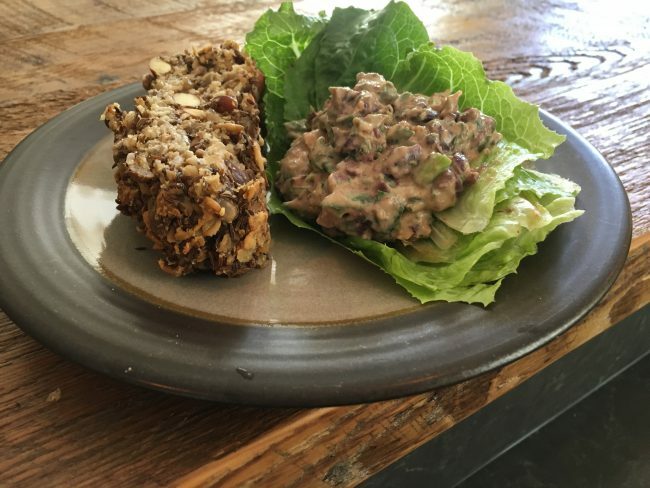 Betsy’s Creamy Olive Dip served with Nutty Toast. Why am I so passionate about eating, serving, and teaching about the value of food as medicine and proactive health for life? Not only am I an OB/GYN (and see all the time how not-their-best people feel and too many pregnancy complications), I am also a Functional Medicine doctor, and started my practice “Mint Health” at Woman’s Hospital to be able to offer women a better approach to lasting health. Most people in our area of the South don’t know yet what Functional Medicine is all about (although it is all the rage in more progressive areas of the country!). I’ll just say that the most fun I have as a doctor is helping people get to the bottom of metabolic issues, digestive issues, fatigue, hormone issues, headaches, amongst other common health concerns, to work on becoming HEALTHIER, rather than just trying to figure out what prescription is best to cover up a bothersome symptom. Many people also come to us at Mint Health to learn how to proactively support their own health and their children’s health, knowing that without learning and being progressive, they will at some point (probably sooner than later) end up not feeling so great, just like the average American. Health starts in the womb and goes until the ripest of age! If you are interested in learning more, I regularly give seminars to help people understand what Functional Medicine is and how you can change your health outlook and your family’s health: see http://myminthealth.com/events/ to register – the next one is October 25th and it’s almost full! I also share lots of fun information on personal and family health at https://www.facebook.com/MintHealth/. We’ll see you there! Betsy’s recommended substitutions for RRR I’s Olive Egg Spread. Fresh is best! Betsy recommends using fresh, local, and organic ingredients as often as possible. Chop the olives, green onion tops, and parsley. Beat the eggs thoroughly. 2. Heat Apple Cider Vinegar to boiling point, adding 1 teaspoon of water before heating to cut the vinegar. 3. 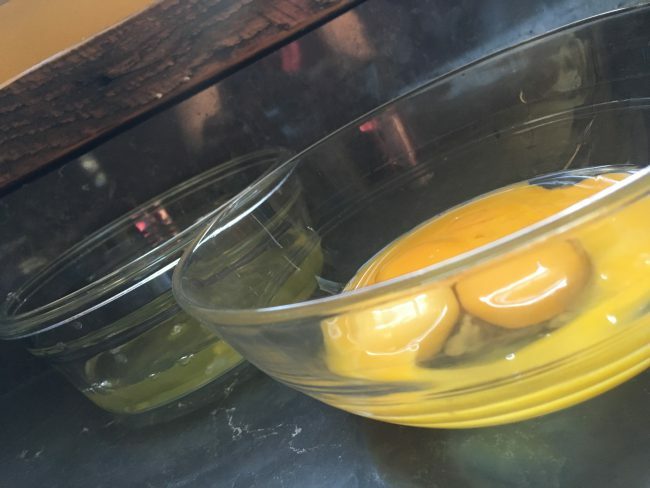 Pour boiling vinegar into eggs, beating constantly. 4. Place egg and vinegar mixture in sauce pan over heat and stir until it thickens. 5. 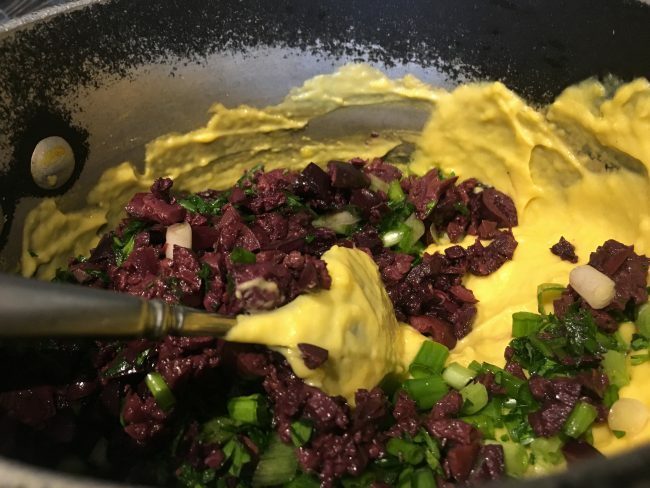 Remove from the heat and add the ghee, then add the Dijon mustard, chopped Kalmata olives, green onions, chopped parsley, salt, and Tabasco. 6. Enjoy over mixed greens with a side of Nutty Toast! Even though the summer may be wrapping up and tailgate season is kicking off, the temperature in South Louisiana is still sweltering in the 90 degree range. For us, tailgating is considered a time honored tradition — we love spending our Saturdays with friends and family under the Oaks, waiting for the band from Tigerland to come marching down the hill! On any given Saturday during football season, you will find a menagerie of food being cooked on the parade grounds at LSU — anything from jambalaya, crawfish étouffeé, fried catfish, boudin balls, to gumbo. As football season wears on, it’s always difficult to know what to take to a tailgate. 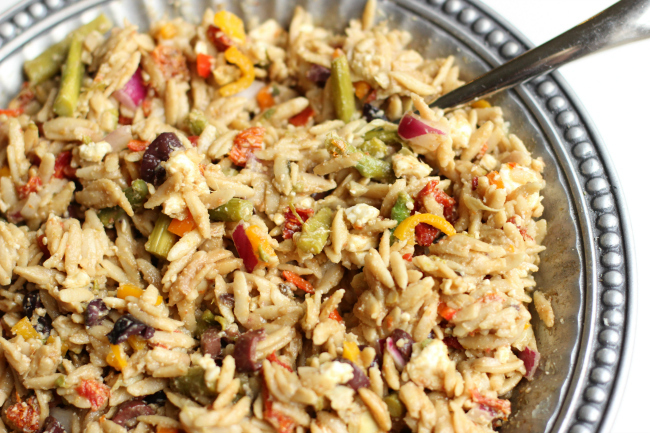 You don’t want to break the bank in the process of feeding the masses, yet you want to be able to bring something that is not the “same ole, same ole.” The Festive Orzo Salad in River Road Recipes IV: Warm Welcomes, is a nice addition to this year’s tailgate menu! You can also add grilled chicken breasts or shrimp to make it a hearty entrée! For the vinaigrette, combine the olive oil, vinegar, mustard, and sugar in a jar with a tight-fitting lid and seal tightly. Shake to blend. For the salad, snap off the woody ends of the asparagus spears. Steam until tender-crisp; drain. Cut each spear into 4 or 5 portions. Cook the pasta using the package directions; drain. Combine the pasta, artichokes, olives, bell peppers, onion and sun-dried tomatoes in a bowl and mix well. Add the vinaigrette and toss to coat. Add the asparagus, cheese and basil and mix gently. Marinate, covered, in the refrigerator for 2 to 10 hours. Let stand at room temperature for 30 minutes before serving.